The final days of spring training are winding down, with 2019 MLB Opening Day scheduled for Thursday. Now, teams are in the process of making difficult roster decisions and determining roles for the beginning of the season. A contract extension for top prospect Eloy Jimenez has eliminated the need for the White Sox to play service-time games early in the season, so the talented young slugger should be on the 25-man roster with a chance to make himself known. Meanwhile, the Blue Jays sent their top prospect, Vladimir Guerrero Jr., back to minor-league camp, where he'll nurse an oblique strain. Fantasy baseball owners have been watching those battles closely, eager to get their hands on young burgeoning superstars and adjusting their own 2019 Fantasy baseball rankings. There are dozens of potential 2019 Fantasy baseball breakouts in your player pool that could define your season. That's why you'll want to see the 2019 Fantasy baseball rankings from the proven computer model at SportsLine. Last season, the proven computer model at SportsLine helped turn owners on to Athletics outfielder Khris Davis, who wound up as the No. 12 player in all of Fantasy after going in the middle of the fourth round (No. 43) in standard CBS Sports leagues. After hitting 43 home runs and driving in 110 runs in 2017, the jump to 48 home runs and 123 RBI in 2018 helped propel him into the realm of the Fantasy elite. The team at SportsLine was all over Davis as a Fantasy breakout from the start. Their Fantasy baseball rankings and cheat sheets said he would outperform his draft position in a big way, and anyone who listened to their advice was well positioned for a league title. The SportsLine Projection Model is powered by the same people who powered projections for all three major Fantasy sites. And that same group is sharing its 2019 Fantasy Baseball rankings and cheat sheets over at SportsLine, helping you find Fantasy Baseball breakouts, sleepers and busts long before your competition. Their Fantasy Baseball cheat sheets, available for leagues on many major sites, are updated multiple times every day. Any time an injury occurs or there's a change on a depth chart, the team at SportsLine updates its rankings. One of the 2019 Fantasy baseball breakouts the model is recommending: Yankees first baseman Luke Voit. Throughout the spring, Voit and Greg Bird have been battling for the right to start at first base in the Bronx. Many believed Voit had the inside track after having a more productive spring and putting up a 1.069 OPS in 47 games last season. However, an injury to Aaron Hicks makes it look likely that both players will make the opening day roster. That means Voit may have to platoon for a week or two before an actual decision is made, but if and when he gets the nod, there's massive potential. Even while his 40.5 percent HR/FB rate could come down to earth, his 47 percent hard-hit contact rate and exit velocities make it clear that his power could be potent. Yankee Stadium could easily yield 30-plus home runs to Voit if he's given a full allotment of plate appearances. 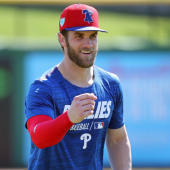 SportsLine's 2019 Fantasy baseball rankings list him as their No. 13 first baseman this season, which makes him a steal considering his ADP is the 23rd first baseman off the board. Another player that the SportsLine Projection Model is tabbing for a breakout year is Twins shortstop Jorge Polanco. After missing the first 80 games of last season because of a PED suspension, Polanco had a strong second half by hitting .288 with a .345 OBP, .427 slugging percentage, six home runs, and seven stolen bases. Extrapolated over the course of a full season, those numbers make him a player worthy of fringe starting consideration at shortstop, but the way the 25-year-old's batted-ball profile has improved over the last three seasons should raise his appeal. Polanco has raised his hard-hit contact rate each of the last three seasons and started hitting the ball to all fields more frequently in 2018. As those numbers continue climbing, he should hit for more power. Plus, the gap-to-gap threat gives him the potential to hit more than 50 extra-base hits per year. SportsLine's 2019 Fantasy baseball rankings say he'll be the No. 12 shortstop in Fantasy baseball despite an ADP of 28. SportsLine is also predicting an emerging star to provide top-six production at his position despite being drafted outside the top 12. You'll want to target him before your opponents, as that could be the difference in winning your league or going home with nothing.